Sudan's president at UAE arms fair Jump to media player Wanted for war crimes, Sudan's President Omar al-Bashir attends the first major weapons fair since the 2014 UN arms trade treaty. 'Low turnout' in Sudan election Jump to media player In Sudan, early reports indicate that voter turnout has been low, on the first of three days of presidential and parliamentary elections. Sudan's election - in 60 seconds Jump to media player Ahead of Sudan's presidential election, BBC Africa looks at what you need to know about what was once the largest states in Africa. A South African court has issued an interim order stopping Sudanese leader Omar al-Bashir, who faces war crimes charges, leaving the country. The International Criminal Court has called on South Africa to arrest the Sudanese president Omar al-Bashir who is in Johannesburg attending an African Union (AU) summit. 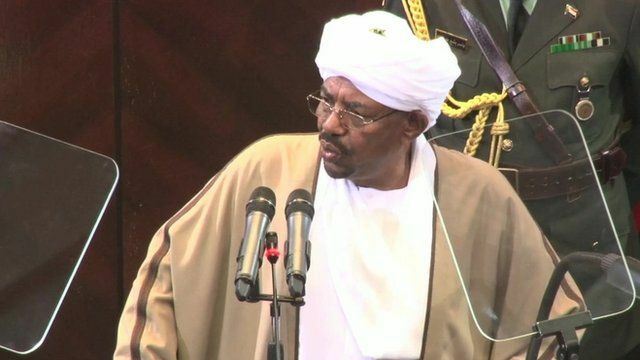 The ICC said two arrest warrants were still outstanding against President Bashir. He is wanted in connection with atrocities allegedly committed in Darfur.